Written as a course, or several courses, in Voudon Gnostic magick, The Voudon Gnostic Workbook guides the reader in Michael Bertiaux’s practices. Because of the term “Gnostic” in the title, I presumptuously expected more use of O.T.O. magick. Ordo Templi Orientis and Aleister Crowley are mentioned only occasionally, and often in negative light (pp. 88, 229, 244). Instead, Bertiaux uses the more historical meaning of the term, “Gnostic”...well...sort of. “Gnostic” of course derives from a Greek word meaning knowledge (why agnostic means not knowing). Gnosticism refers to a mystery school that developed between 100 BCE and 300 CE. Gnosticism contains elements of Christianity and Greek mystery religions. The Voudon Gnostic Workbook claims to draw upon traditional Gnosticism, but is so strongly influenced by Haitian Voudou that many early Gnostic elements are lost. Bertiaux intends Gnostic as in Gnosticism instead of Gnostic Mass, but in the end draws more from Voudou and personal revelations than from Gnosticism or ancient Greece. Keep in mind that Crowley assumed common origins when titling his service the Gnostic Mass. I divide my books into two categories: those which I will read cover to cover (fictional novels, biographies, non-fiction books with an important timeline or chapter sequence) and prized reference books for my shelves I will turn to when searching for specific information (encyclopedias, grimoires, collections of short stories, anything with comprehensive indexes). 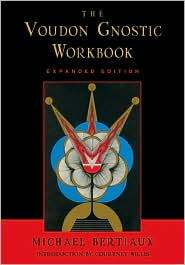 Upon first assessment of the book, I expected The Voudon Gnostic Workbook to land in the second category. Believe it or not, I recommend reading The Voudon Gnostic Workbook (if at all) straight through from cover to cover, skipping only paragraphs here and there if you must. I first started the book by scanning the table of contents for sections that interested me. I found each section difficult to follow without the lessons that had come before. Once I started over from the beginning, I found the book more fascinating and readable. The small type and dense information did not slow me down as much as I had feared. I read the first 100 pages in two days.